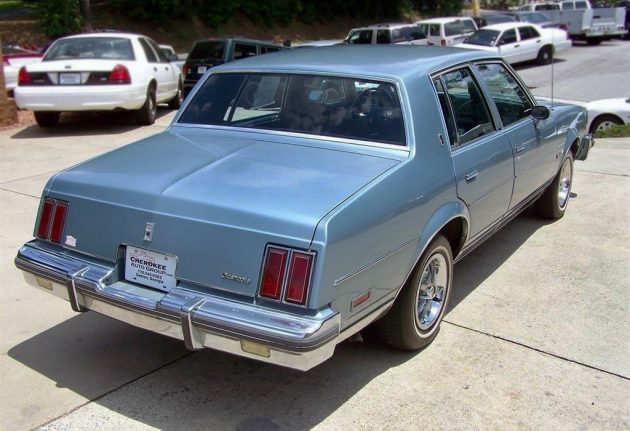 The fourth-generation Cutlass sure changed during its 1978 to 1988 run, and it was the last rear-wheel drive Cutlass. 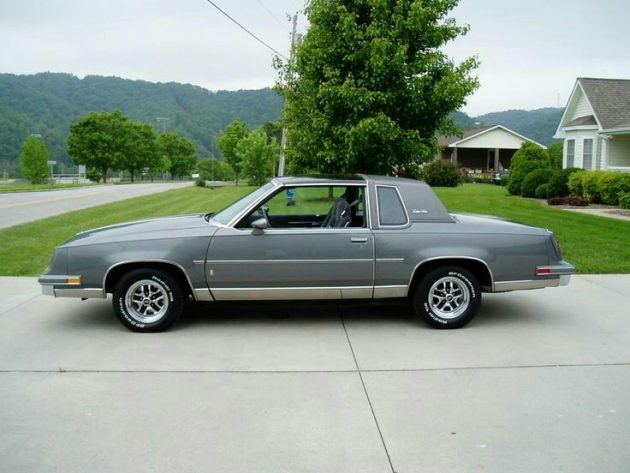 This beauty is a 1985 Oldsmobile Cutlass Supreme and it’s as nice of an example as you’ll probably ever find. 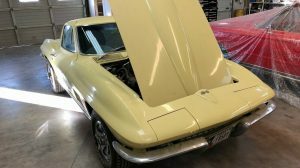 It’s listed by a dealer on eBay in Canton, Georgia for $8,690! Wow! But, it’s a nice one, reeeeeeal nice. This unbelievably nice survivor is from California (aren’t they all?) and it has z.e.r.o. rust! It also only has 36,700 miles on it. And no, not 136,700 miles! This is one amazing car, at least in its condition. I know that this isn’t the dream car for too many people, but any time that I see a vehicle this nice that’s three decades old it brings me back to that era. Most people are interested in two-door cars but this four-door sedan would have been much more handy for a family. This car really shines in the details, check out all of the photos on the eBay page and I think you’ll agree that this Cutlass Supreme is in supreme condition. And, then there are those great looking wheels! This car has the optional F41 sport suspension package. 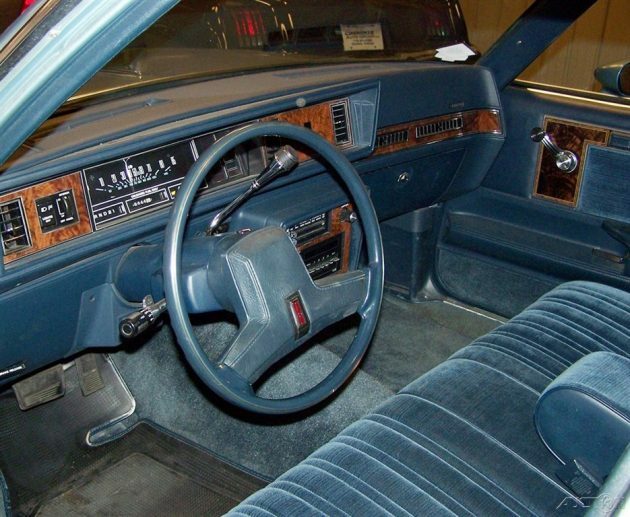 The interior is equally perfect-looking, but it’s always strange to see a car of this vintage without power windows. 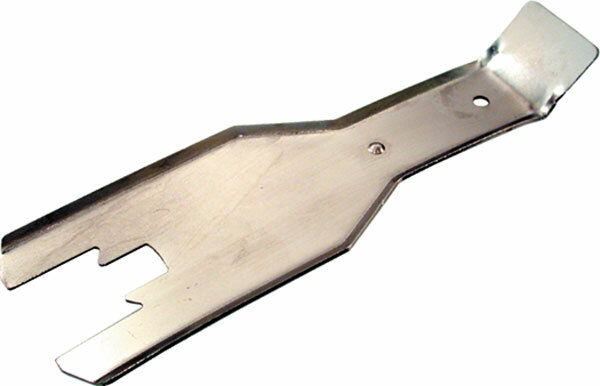 There’s hardly a person alive today under the age of 30 that has a clue what a window crank is. And, there aren’t even window cranks, or operable windows, in the rear other than little wing windows! Those wacky safety folks… From the seats to the dash to the headliner, and even the trunk, this car looks pretty much like new. The engine in this blue beauty is Oldsmobile’s 307 V8 with a four-barrel carburetor and 140 hp. The engine and engine compartment look as nice as the rest of the car does. It wouldn’t take much to detail this car and get it ready for show-and-shines or, dare I way, cars and coffee events? No, it’s not some high-buck exotic or some bubble-bursting 911 or E-Type, it’s a four-door Olds Cutlass. But, as they say, always buy the nicest one that you can find and for anyone looking for one of these, I would argue that this may be the nicest one out there. Whether it’s $8,690 nice is another question for another day. My mother in law had one these. Bronze, vinyl top, wire wheel covers, power everything and pillow velour seats. Beware the rear passenger door window glass is fixed…need good ac. MIL thought ac reduced gas mileage…she was tight with ac and kept front windows up. My late dad had a 1980 model that was brown in color and he loved it. 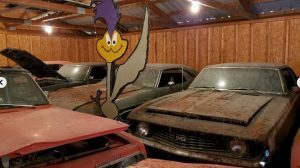 However, when he passed away in 1988, my mom didn’t want to sell it for sentimental reasons but she needed the money to help pay for his funeral expenses so she reluctantly had to let it go. My dad drove one for several years-comfortable but slooooow. It would make a pretty cool sleeper with a little work. Very nice offering. No,it’s not an 88 or 98 but,they were a affordable blue collar family sedan with comfort, decent MPG’s and good reliability. I would much rather have this one over a jellybean accord or camry. (Notice how I didn’t capitalize those makes). This car is gorgeous! It may not be what most collectors are looking for, but you couldn’t ask for a better daily driver for under $10k. These were comfortable and dependable cars. I’d take this over any of the modern FWD trash out there! 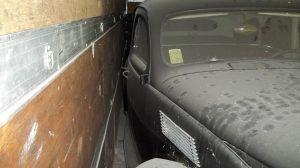 It may be a different model, but here is a pic of my old neighbor’s Olds down in Philly that hasn’t fared quite so well. Actually, if it is still on the road I guess it is doing ok with PA safety inspections. I grew up next to this car. It is still there. I’m now 47! Go Olds! 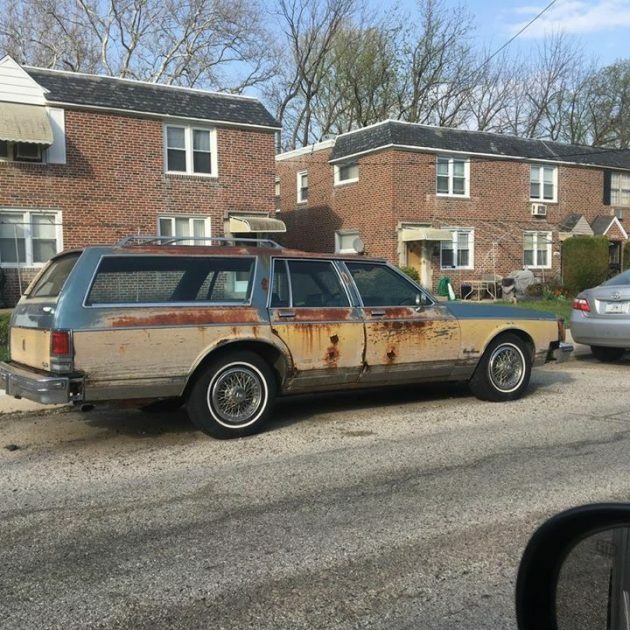 Yep….Real Rust Belt Patina ! Lots of these cars were very well taken care of by middle aged professionals I can find 2 door g bodies in as good of shape for less money. Nice but I don’t think $8.6k nice. Big whoop! Ya ya, its old and preserved, and that makes it valuable to some, sure. Value is what someone is willing to pay for it. But these were basic “bic lighter” throw away machines in their time…use em up as they were designed to be, nothing more. (I guess that goes for most machines). The rally wheels was something to made a big deal about even when they were introduced…but I don’t see much to get excited about…if that’s what is needed to get excited about this car…well….and further, those sealed rear windows are akin to the automatic door seat belts that y’all thought was a step in the right direction…put it in a museum so no one forgets. The ‘sealed rear windows” were so GM could keep the hip room from the Colonades when they downsized their intermediate range. The rear armrests occupy the space that would have housed the window mechanism. I love this Cutlass. Desmog the engine, true duals, and I’d be delighted to own it. 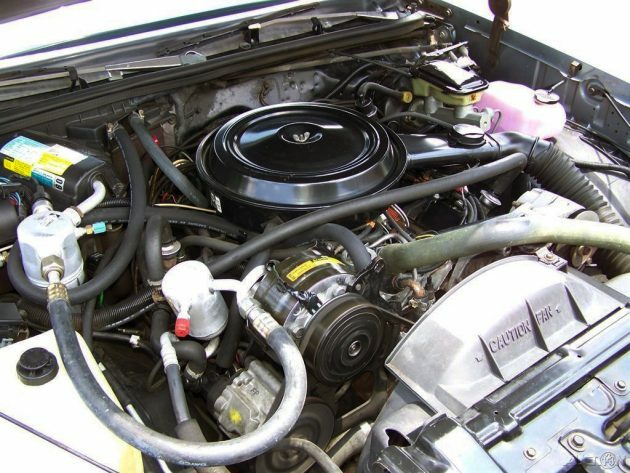 Or perhaps store the original engine & trans and throw a Olds 350 or 455 in it. I had 2 of these cars, one a wagon with a V6, the other like this, V8 ( not sure which one, they offered several) As I said in the past, great cars, one of the few cars my ex-wife didn’t kill. The V8 sedan was running a bit rough, so I thought I’d change the plugs,,,how hard could it be? Well, most came out, except the last one ( there’s always one) Located under the heater, it was practically unaccessable. It took every swivel and extension I had. When I finally got it out, it was a different brand than the rest, ( possibly original?) and had no electrode left. I was surprised it ran at all. Sure these were basic people movers, but on the classy end, and of course it’s rare, especially like this ( I have no reason to doubt the mileage). I heard, the reason the rear windows were fixed, was these were marketed to families with children, ( worked for me) and was a safety measure so kids wouldn’t fall out. Wide spread seat belt use had not really caught on yet. ( and it saved GM money) Great find. On most GM cars like this you take off the front passenger tire and there is a hole in the inner fender plastic to reach the plug. Nice car, but only worth about half what they are asking, IMO. 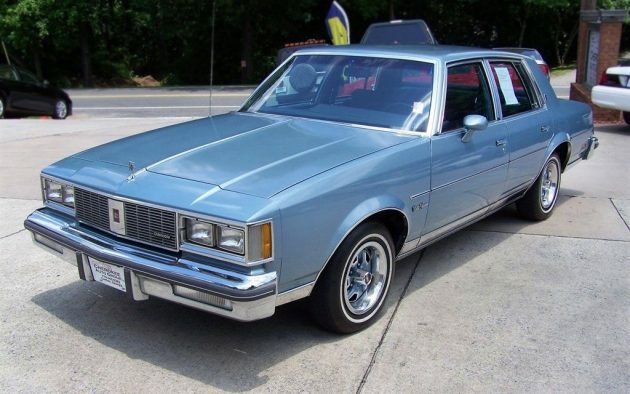 My wife had the 4 door humpback version of this car (think it was a 1979?) when we first started dating. That wretched v6, same blue “paint” as this car (in Texas it had faded, and no polish could bring it back). Ugly, slow and cheap. When they downsized these cars, seems like it downsized everything. Even the pedals seemed smaller. I hated that car so much. Worst car ever for me. Drove a lot of those when I worked in dealers. Nice little car especially with the V8. I was once told by a factory rep that there were 3 reasons for non opening rear windows in that era. 1, a/c so common not nec. (Huh?) more rear seat shoulder room, and weight break for mileage and emmisions. I had a Regal Demo similarly equiped. Didn’t want to give it up. I like to compare gen 3 to gen 4 cars, because it’s not really obvious what was gained and what was lost. Both suffered from reduced horsepower and sub-par interior finishes, so which is better? from a power aspect, it seems to be a draw…gen 3 cutlass w/350-4 put out 180 hp for 3800lbs or 21 lb/hp, gen 4 cutlass w/307-4 put out 160 hp for 3300lbs or 20 lb/hp…not a substantial difference, which makes the favorite more of a subjective decision rather than a performance one. I personally like the looks of the gen 4 2-doors, but I think quality and comfort were slightly better in the gen 3. What do you guys think? always liked this design of Cutlass. Second to the pre downsized 1970’s version. I had a 82. Great car. Love it but that’s too much money. Nice car, but not for that price. Last fall I bought an 87 Cutlass just like this but in Red. V8, 75k miles, No rust & in near perfect condition with a bit of faded paint. Price? 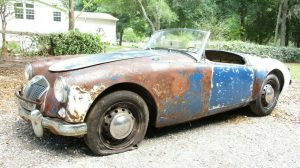 $1200.00 Just because it is a nice car, does not make it desirable or valuable. This is a $2500 car at the most. AS equipped, this will make for 1 nice-handlin’ little scooter! 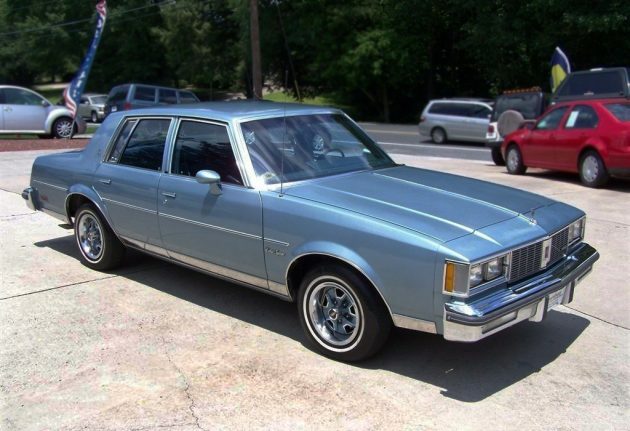 I had an’ 83 9C1 Malibu…& that puppy was a veritable 4dr. Z28. Looks like “buy it now” has been used. Apparently the market is a bit more that $2500.00. I was in Oldsmoble sales for 30 plus years and must have sold 200 of these in this exact model. A descent car for the times and ran well even with all the smog plumbing on that 307.